skye is just about 8 years old. raised her from a 5.5 week old baby, and saved her life from a petstore having pnemonia and enterobactera. over the last 4 years i have had some feather plucking issues with her, once when i threw out the roommate, (now him i will glad say i got rid of and took out the garbage cuz thats what he was!). she got a mild infection and it was just her down feathers, the fuzzy ones. a year later somebody left kittens on my door step, and i found a newborn baby kitten under my porch, i adopted the one kitten out, the mom had her babies all but one died and the baby under the porch lived, adopted them out. and she plucked again. this time it was worse and i caught the infection when she smelled, got her treated again. last year i took in an unwanted macaw rehabilitated him and trained him and adopted him out, (didnt want to breed he was a bg like skye and he was turning mean against me and i got a nice scar to prove it) she did it again. really bad with the down. her wbcells went dangerously high, though i got her treated. now its been 6 months since that, have more changes in my life and she is doign it again, this time with her colored feathers. the ones that start growing in and have the sheaths to them and are sticking out she doesnt like. she is pulling them out. no infection, no rashes i mean last time it was so bad omg! now im getting worried though. i dont know what to do to get her to stop. she is very rarely caged as i work at home and she is always with me, though i did create a monster cuz if i leave her to go do laundry she screams momma and starts literally cussing and screaming. (you would think i had a kid not a bird) she figured her way down the stairs, walking as she is clipped thats how attached to me she is. im not sure what is going on with her. and im really worried. does anybody know what i could do here? she has a buddy a greenwing macaw that she actually grew up with that i had some issue with adopted him out to what i thought would be a better home and my nightmares led me back to bringing him back home to stay for life. and 2 dogs as well that i saved the puppies life 2 vets said put her down and i said no. the older dog was a petstore totally sick dog that i treated and got better. i always seem to be doing animal rescue and finding forever homes one way or another. i wonder if this is too much on skye? or me taking this new job and working nights is affecting her? i dont know. HELP? Re: plucking need help please! Sounds like skye is really attached to you and with you caring for other animals, she might be jealous. Emotional issues....My macaw gets really jealous when I'm playing with anyone other then him. What type of diet do you have her on? Does your house stay pretty dry? Humidifier will help with that issue. What type of bird is she? Sounds like Skye has a stability problem. Unless someone comes up with a magical solution, you may have to make a difficult decision. Which is more important to you; your continuing role as a "savior" to stray animals, or Skye's well being? 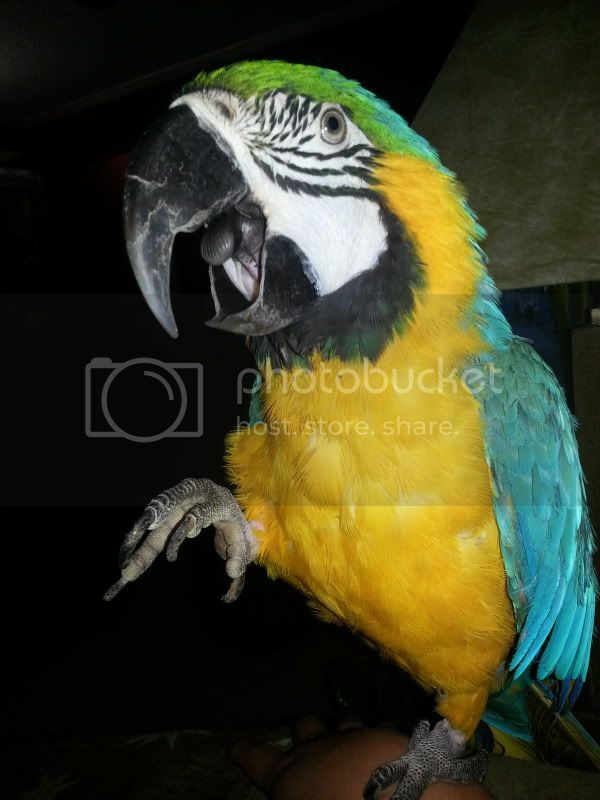 You really need to find out why she is plucking and stop it ASAP or you will end up with a naked Macaw. Macaws for the most part do not like change. Moving a cage, bringing in new animals not to mention illness into your home could effect your macaw. Keeping your macaw on a schedule is really important to a Macaw who has such a strong bond with you. I know it's hard with her screaming, but just because a Macaw calls out for you doesn't mean you should come running to her. Letting her play in her cage is a good thing and time alone to play with her toys without having to see what animal is in the room with her can really stress a Macaw out. Remember, Macaws in the wild are pray animals so cats, dogs, love nothing more then to attack a Macaw or the Macaw thinking it may be attacked. Aloe? Interesting. You're not concerned that the bird might ingest some of the aloe during preening? There must not be a problem since undoubtedly your birds have done exactly that and have shown you no adverse effects--otherwise you would probably have stopped. Aloe is on the list for safe plants for birds.